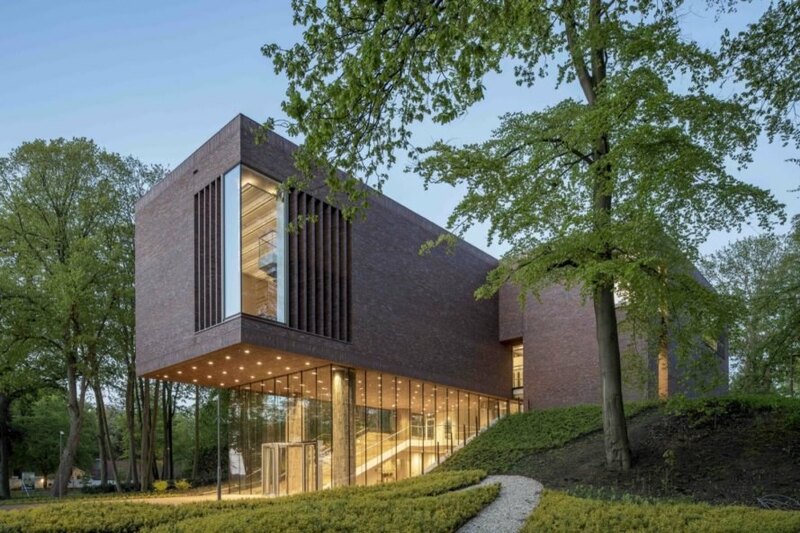 Rising out of a historic dike, the new Lisser Art Museum pays homage to the landscape’s context while offering a new contemporary cultural destination in Lisse, The Netherlands. 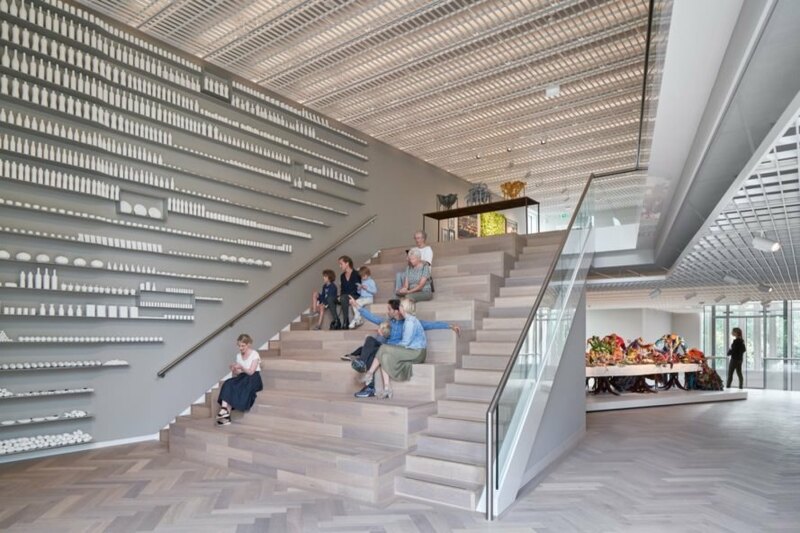 Dutch architecture firm KVDK architecten headed the recently completed project and embraced smart, sustainable solutions from the optimization of natural daylighting to gray water collection systems. 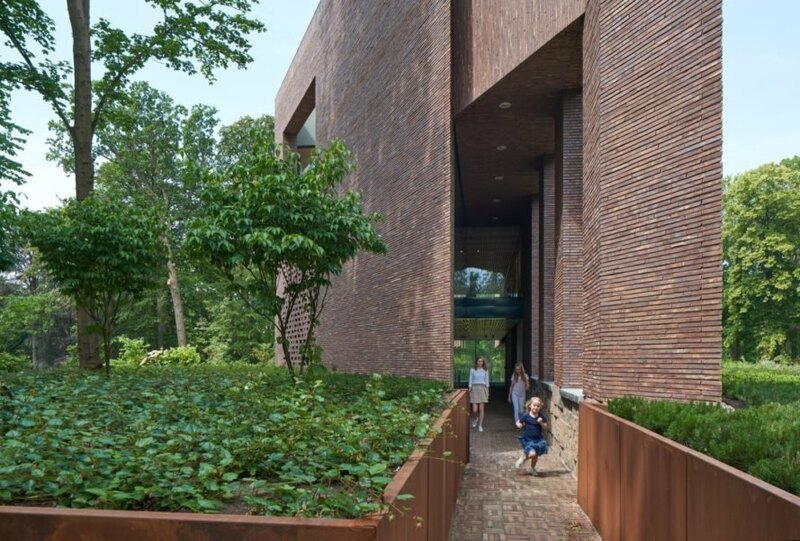 Wrapped in earth-colored Petersen bricks, the modest, light-filled building feels like an extension of the forest, and ample glazing provides connection with nature on all sides. Commissioned by the VandenBroek Foundation, the small-scale museum is located in the Keukenhof, a former country estate dating from the 17th century that had featured a terraced garden with an artificial dike — unique in the Netherlands at the time. The estate was later redesigned in 1860 by landscape architects J.D. and L.P. Zocher, who transformed it into a cultural park that has since achieved national heritage status. 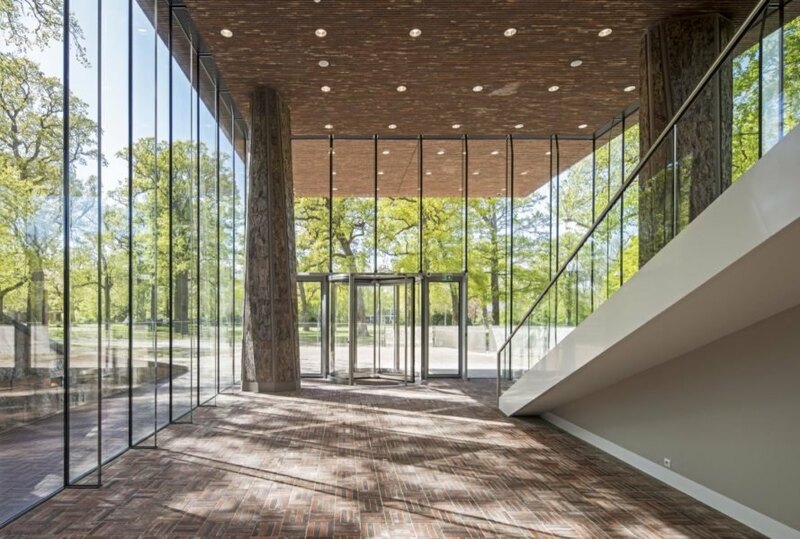 The recently completed museum was an addition in the Keukenhof cultural park masterplan drafted in 2010. 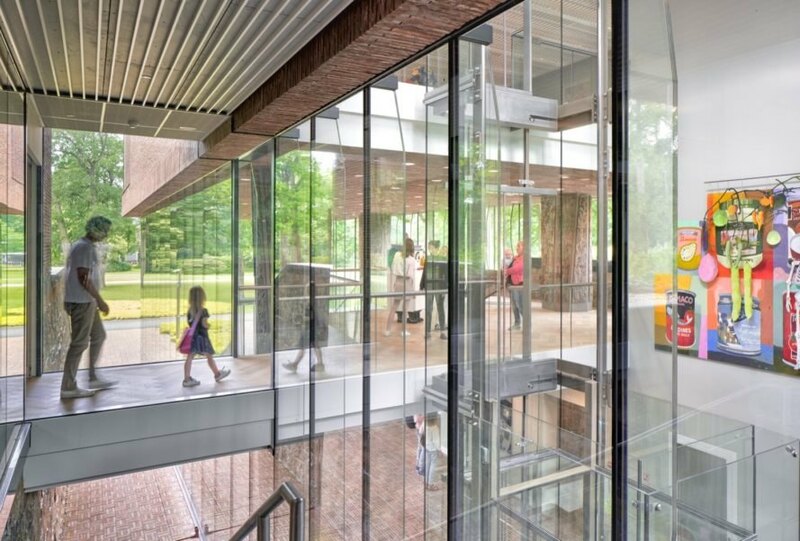 The museum comprises two main volumes, the lower of which is set into the dike — glass curtain walls emphasize and embrace the land form — and supports the upper, cantilevered volume enclosed in brick. The interior is flexible with multipurpose spaces and follow the Guggenheim principle in which visitors experience all the exhibition spaces by winding down from the highest point. In addition to natural lighting, the museum is equipped with thermal energy storage, a green roof and a gray water system for toilets. The museum depot is located inside of the dike to take advantage of the earth’s natural cooling properties. The museum is built with Petersen bricks. The museum rises from a historic dike. Glass curtain walls surround the lower volume. The stairs also offer seating. The museum follows a Guggenheim-like layout where visitors explore from the top down. 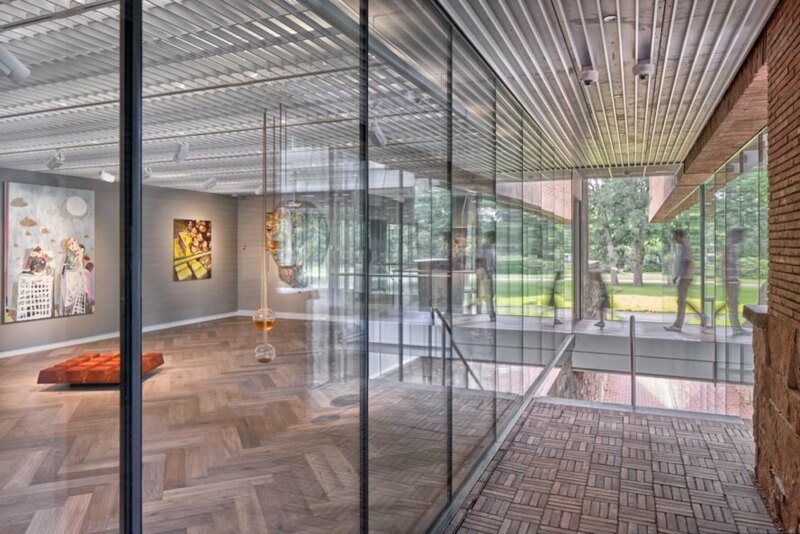 Ample glazing blurs boundaries between the indoors and out. The museum blends in with its landscaped surroundings in Keukenhof.